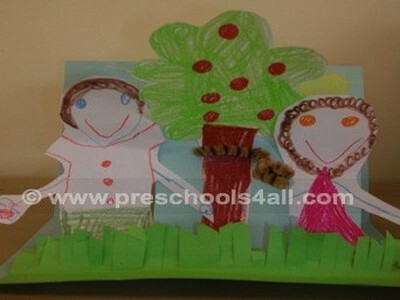 This kids bible crafts based on the Adam and Eve story is fun and simple to create. 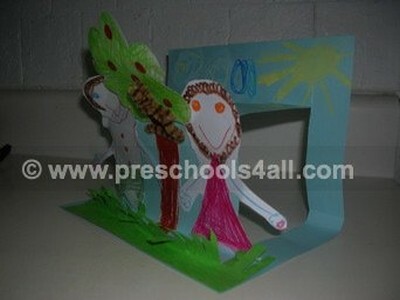 The children love the 3D effect and the added snake. Read the story of Adam and Eve to refresh your memory and view other points of discussion. 1. Fold the blue construction paper in half. 2. Cut it four times from the folded end to about 2 inches from the edge. 3. Let the children draw Adam Eve and the forbidden tree on the white paper. 5. Use the pipe cleaner as the snake and wrap it around the tree trunk, puncturing through the paper. You can bend one end of the pipe cleaner to create the snake's head. Cut the green strip of paper to create the grass and glue it on the bottom of the page.